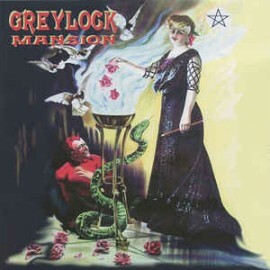 Greylock Mansion emerged from Tucson, Arizona in 1968. The band's sound was powerful, deep underground psych with thick, dominant funereal organ and distorted fuzz guitar and effects, backed by heavy precise drumming. The Doors and Iron Butterfly influences are evident, and a touch of early Black Sabbath’s slow grinding sludge rears its head at times. For all the desired heaviness, which is plentiful, the lyrics might be even more impressive—dark, meaningful, thoughtful, masterfully constructed and thought provoking, with mystical, sci-fi and otherworldly themes like time travel, death, and other wicked inventiveness. It would be difficult to believe that Greylock Mansion's lyrics and music were written by a 19-year old, until you realize that the teen in question was Merl Reagle, soon to be a master wordsmith, raconteur—oh, and the most famous crossword puzzle author in the U.S. Reagle was syndicated in the largest newspapers in the country, made numerous television and movie appearances, and was even portrayed on the enormously popular TV show, The Simpsons. Roaring heavy fuzz guitar, doomy organ and spiritually mysterious psychedelia—a robust and compelling mix of original songs that meld science fiction, horror movie themes and Reagle’s lyrics. Greylock Mansion's musicianship, heavy yet melodic tunes, and songwriting are superior to many of the “big name” bands of the time; they can finally and deservedly be heard and appreciated by fans of the heavy ultra-obscure underground psychedelic gems of the era. Included are three inserts—a 4 page folder with pictures and text; a psychedelic poster w/lyrics; and a color reproduction of a poster from Unifest 1970 in New Mexico. Nine original songs, all of restored and remastered from the original 1969 studio reels. Three of the tracks were released on private label 45 micro-pressings in 1970 and 1971; the other six cuts are released for the first time!